Pictures, images & photos of the Great Norman Cathedral of Monreale, Sicily and its Byzantine Mosaics. The world Norman and Sicily do not sit naturally together for many people, yet The Normans did not only conquer England they help principalities all the way to and including Jerusalem. The Norman's were descendants of The Vikings (North Men). Their barbarity is legendary but what is often forgotten is that after converting to Christianity the Normans became fanatical Christian patrons founding greta Abbeys like Mont St Michele, Cathedrals like Durham Cathedral and sponsoring great works of art like the Byzantine style mosaics of Monreale Cathedral, Sicily. The building of the Cathedral of Monreale was begun in 1174 by William II, and in 1182 the church, dedicated to the Assumption of the Virgin Mary. 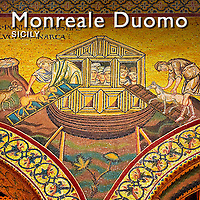 Monreale is a political statement by William II who wanted to weaken the power of the Palermo cardinals by creating a great cathedral at Monreale outside the city. Like most Norman cathedrals Moreale Duomo is a Norman Romanesque basilica was built on a massive scale in record breaking time. The inside of Moreale Cathedral is tiled with Byzantine style mosaics which cover a staggering 6,500 m² of its interior. The mosaics of Monreale depict scenes from the bible and over the altar is a huge Greek style Christ Pantocrator. Next to Cathedral are the cloisters of Monreale monastery. 126 white marble pillars support medieval craved capitals and arches of Monreale's spectacular cloisters. Every capital is carved with a different mythology of biblical scenes. Fantastic medieval animals entwine themselves around the pillar capitals and columns in an extraordinary demonstration of the exuberance of medieval art and proof, if one were needed, that the dark ages were not very dark at all. To give real power to Monreale Cathedral, William II made it his and his families burial place, and there they lie in great medieval sarcophagi. The Normans are an underestimated cultural force of the medieval world. Their ruthless exploits have overshadowed the great building and works of art they bestowed. Buy as high resolution stock royalty free images of Monreale Cathedral and its mosaics or download on line or buy as photo art prints.